A group of scientists from Russia and Sweden showed that applying gold stripes to a sample with silicon quantum dots modifies the dots' properties. Their study results were published in Scientific Reports. Silicon quantum dots have a wealth of potential applications in cell biology and medicine thanks to their selective cell penetration capability and luminescence. Biosensors based on silicon quantum dots can be used as an early diagnosis tool for various diseases, while silicon nanocrystals hold a great potential for developing silicon-based light-emitting devices and producing highly efficient solar cells. 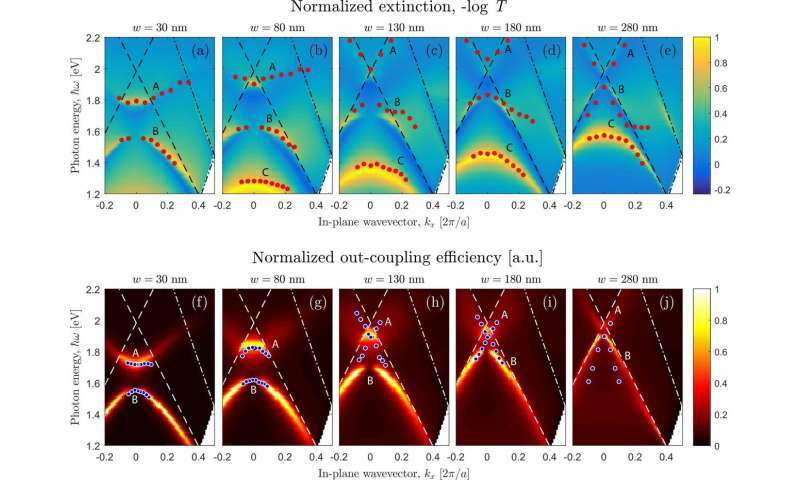 Scientists from the theoretical nanophotonics team led by Skoltech Professor Nikolay Gippius jointly with researchers from Moscow State University and the Royal Institute of Technology (KTH) in Stockholm demonstrated, first theoretically and then experimentally, that gold nanostripes are capable of changing the extinction and photoluminescence spectra of silicon nanocrystals. They established that the nanostripe width also affects the optical properties of the quantum dots. The researchers' findings are of particular value for practical applications of silicon nanocrystals, as they provide scientists with a novel tool for controlling the quantum dots' properties. Interestingly, the use of silicon quantum dots in photocells would significantly reduce technical losses in the solar power industry and help to avoid using arsenic, lead and other toxicants in solar cells production. "Derived from the interaction between a sample of silicon quantum dots and gold nanostripes is a quasiparticle called the waveguide plasmon polariton. This leads to a change in the optical properties of silicon nanocrystals. If we wish to use them in solar batteries or light emitters, we should have a metal electrode and know how to control the extinction and emission spectra. Gold nanostripes are a solution to both issues," says the main author and Skoltech researcher Sergey Dyakov.